For the subject see Hölbl, Sard 321-2, comparing the gold bracelet, his pl. 158.3 (hawk head). 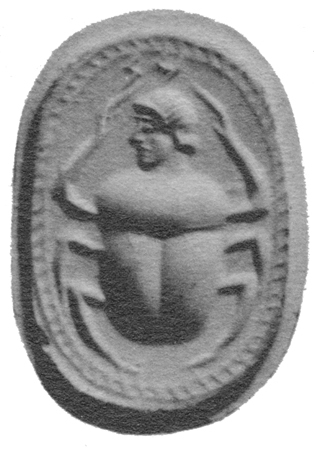 A Greek version has human head and no wings or disc: AGGems no. 173. There is usually a small disc also between the rear legs. 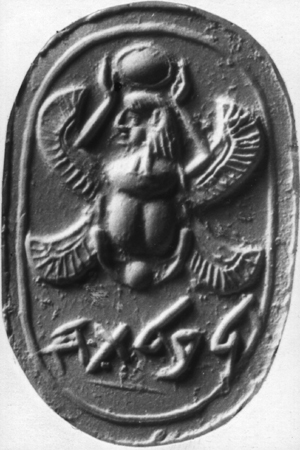 The true Egyptian type normally has two wings only; here there are often four, a feature, even with a human head, of earlier Levantine glyptic (cf. Sass/Uehlinger, 215-217). 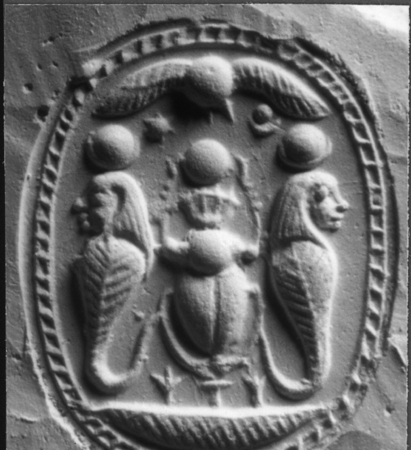 The two-winged appear on the 7th-century glass scaraboids (AGGems 20-22) which, from their distribution, might be Greek egyptianizing rather than Levantine. For examples in Cyprus, Reyes, nos. 269-271. 5/3 Oxford III, no. 560, pl. 18, bought in Cyprus (1891.640). Reyes, no. 116. BL. 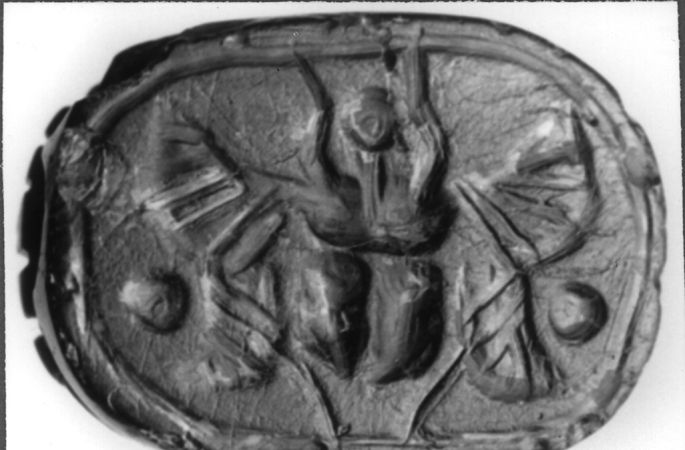 Four-winged beetle; two discs. 5/X1 Ibiza no. 224 (Madrid 36969). Cornelian. BH;EXnb. 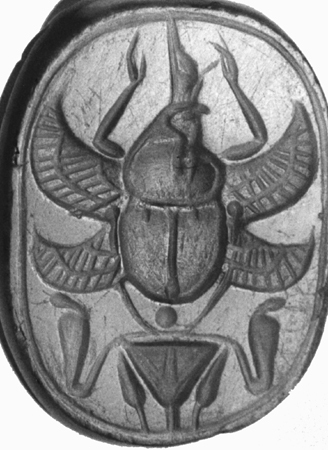 Four-winged beetle holds disc, on lotus with side buds. 5/X2 Cagliari, from Tharros. Marmora, pl. A 30; Hölbl, Sard no. 19. Sardonyx. BL;EXnb. 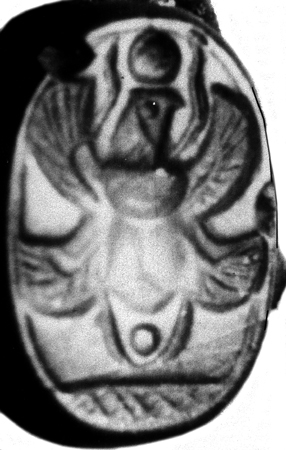 Two-winged beetle over a large lotus flower with entwined uraei and lotus buds (like the unification of the two lands sign); at either side apes, disc-crowned, holding beakers?, sitting on sn rings. 5/X3 Oxford III, no. 280 (1890.139), bought near Corinth. Blue chalcedony. BL. 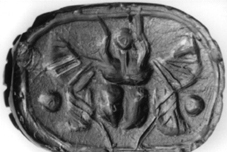 No discs; four-winged, with hawk-head and raised arms, double-crowned. Over lotus flower and buds flanked by uraei. 5/X4 New York no. 23, pl. 4. AGGems no. 173. Cornelian, with winglets. BH. Human head, no discs, inscribed above (Cypriot zo). 5/X5 Péronne, Danicourt Collection. 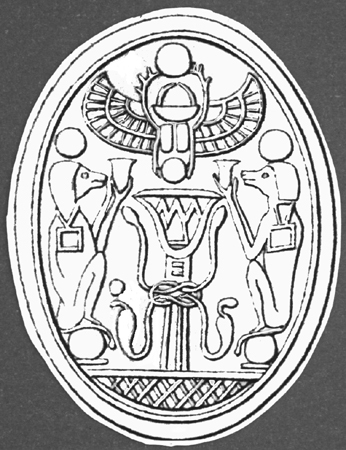 RA 1971, 196, fig. 2 (Boardman); Sass/Uehlinger, 122, 61, and 215-217, 88 (Gubel; Sass). Lapis lazuli scaraboid pierced laterally. BL. Human head, four wings, inscribed in Hebrew, blth.